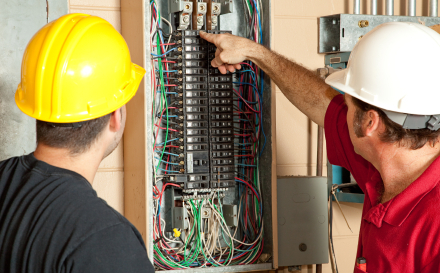 ARE YOU LOOKING FOR AN ELECTRICIAN & ELECTRICAL CONTRACTOR IN LINDENHURST, NY? Electricity is an intrinsic part of our everyday lives and one that we often take for granted, until the power goes out. If you have been recently suffering interruptions to your electrical service or your appliances are not getting the flow of power that they require to operate, it is time to schedule a visit from one of the licensed and insured electricians from Sure Line Electric. Our electricians have years of experience providing Lindenhurst with results that set us apart from the competition. We have the skills and equipment necessary to make certain that the job gets done right, safely, and efficiently. We are even available for emergency repair services, year round, 24 hours a day. When you get the service of our professional electricians, you can get quality customer-service and guaranteed work that we stand by. To see the difference our experienced contractors can make, give us a call! Your panel box is the brain of your home's central nervous system, and as such you need to make certain that it is not being overworked. If your panel box is not up to par with your demands then that means it is being put under a significant amount of stress that will force it to draw on more energy than is needed. In these cases, a panel box upgrade is often the solution, as a larger unit can help manage your home's electricity needs. If your panel box is not up to the task and you are in need of a panel upgrade, contact our Lindenhurst electricians today for a free estimate. Electrical repairs in LIndenhurst are an important and sometimes daunting task with everything that can potentially go wrong. You should never take the risk of handling your electrical repairs yourself, instead you should turn a professional solution. Electricity is extremely hazardous and as such you only want your electrical repairs to be handled by a licensed and insured professional. Our electricians have the experience and know-how to handle all your repair problems as safely and efficiently as possible.